WASHINGTON, D.C. – U.S. Senator Barbara A. Mikulski (D- Md.) announced that her bill introduced to eliminate the terms “mental retardation” and “mentally retarded” from federal education, health and labor laws passed the House on Sept. 16 by unanimous consent. It passed the Senate last month, and will now go to President Obama for his signature. Senator Mike Enzi (R-Wyo. ), ranking member of the Senate Health, Education, Labor and Pensions Committee, was one of the original co-sponsors. A family in Edgewater, Maryland provided the inspiration for the law. Nina Marcellino is the mother of four children, including Rosa (pictured), a child with Down syndrome. Last year, Nina learned that Rosa had been labeled retarded at school. Nina didn’t allow the R-word in her house, and none of her children described their sister that way. 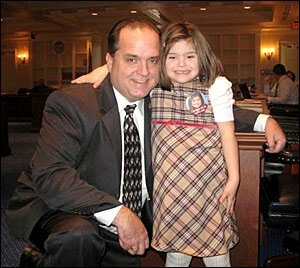 Nina teamed up with other parents and her state delegate to introduce a bill to change the terminology in Maryland state law. Before the bill was brought up for consideration in the Maryland General Assembly, they held a hearing on the implications of changing the term. Senator Mikulski met Nina at a roundtable discussion on special education last April. Nina told the Senator about Rosa’s Law and their plans to bring it up for consideration in the state Assembly.Senator Mikulski promised Nina that if the state law passed the Assembly, she’d take it to the Senate floor. Two weeks later, Rosa’s Law was unanimously approved by the General Assembly and then signed into law by Governor O’Malley. Rosa’s Law changes the phrase “mentally retarded” to “an individual with an intellectual disability” in health, education and labor law. It makes the language in federal law consistent with that used by the Centers for Disease Control, the health arm of the United Nations, and the White House through the President’s Committee for People with Intellectual Disabilities. The House bill had 72 cosponsors. The law does not affect any services, rights, responsibilities or educational opportunities for people with intellectual disabilities.